Home » News & Updates » Welcome Dale Brown! Welcome to Dale Brown, Assistant Property Manager. He started his new position on October 22. 2018. 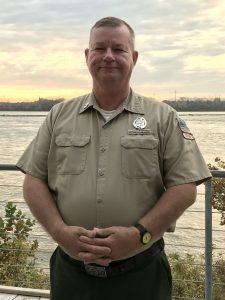 Even though he is new to the position, Dale was a Falls of the Ohio State Park volunteer from 2008-2016, then a seasonal naturalist and volunteer coordinator from 2016 until he accepted his current position in October. He received the Monarch Award in 2018, established by the DNR to recognize the top seasonal naturalist in Indiana. Dale is originally from Forest Oak, Illinois, served in the U.S. Army for 25 years and is a graduate of Indiana University Southeast with a degree in Geoscience. He has two daughters and one son. He has visited all 50 states and almost every national park, monument and historical site. He enjoys collecting fossils, seashells and minerals. Camping, hiking, fishing, kayaking and survival techniques are his favorite outdoor activities. Dales has a ten year plan to enhance the Falls of the Ohio State Park via transformation, modernization and by working closely with partners such as the park volunteers, the Falls of the Ohio Foundation and the Ohio River Greenway to meet the park’s mission statement ; to elevate the visitor experience and to increase attendance.